The SENNEBOGEN 875 port crane that Heavy Movement has been using at the Port of Santander in Spain for a short time is now proving itself with state-of-the-art technology and low consumption. The handling machine is tasked with continuously supplying the nearby steelworks with scrap delivered by ship. Sales and service partner MYCSA in Spain delivered a new 2014 E-Series SENNEBOGEN 875 to the Port of Santander. The green machines have long since become indispensable among the extensive machinery belonging to customer Heavy Movement. Around 20 material handlers around the globe are showing their stuff without fail. It is not rare to reach up to 20,000 hours of operation. Nothing less is expected from the new 875. 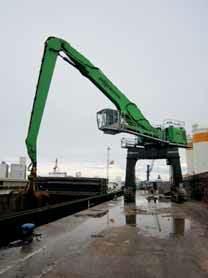 The new port crane is equipped with an economical 391kW diesel engine and a 27- metre-long attachment. Built on a crawler gantry undercarriage, the handling machine can traverse the length of the wharf with ease. Every day, ships come to Santander filled with mixed scrap for the nearby steelworks which is unloaded by the 875 handling machine. cylinder located between the two hoist cylinders, and multiple compressed gas cylinders in the rear. Every time the boom is lowered, the energy recovered is temporarily stored. This energy is then available for the next stroke. This system saves considerably on fuel. The Green Hybrid system saves up to 30% more than conventional drives. Measurements reveal this impressive success. Compared to the competition's forerunner, the 875 requires up to 12 litres less fuel per hour for the same performance — a one-of-a-kind achievement for this machine class. An optimal view of the work area, safe unloading from the hull of the ship and first-rate ergonomics for the operator is what is offered by the comfortable Mastercab operator cab, which can elevated to nine metres. Equipped with the SENCON control and diagnostics system, the operator can keep an eye on all machine parameters. The spacious cab even has enough room for an additional passenger, such as a trainer.